This is the legendry Markat Mani. In Rabbinical legend it is related that four precious stones were given by God to King Solomon; one of these was the emerald. To this supernatural power inherent in the stone, enabling it to quicken the prophetic faculty, may be added many other virtues. If any one wished to strengthen his memory or to become an eloquent speaker, he was sure to attain his end by securing possession of a fine emerald. And not only the ambitious, but also those whose hearts had been smitten by the shafts from Cupid's bow found in this stone an invaluable auxiliary, for it revealed the truth or falsity of lover's oaths. 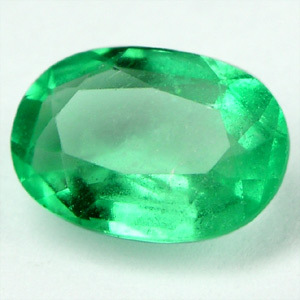 Emerald cures epilepsy and neurological disorder. This is the remedial of planet Mercury. This is also the stone of commerce. Buried under a commercial house and embedded in the main door it boosts business. Business never stops in such a house. Emerald sharpened the wits, conferred riches and the power to predict future events. To evolve this latter virtue it must be put under the tongue. It also strengthened the memory. The light-colored stones were esteemed the best and legend told that they were brought from the "nests of griffons." Emerald occupies an important place in many mythologies; according to the Bible, it was believed that when Lucifer was cast out of Paradise an emerald fell from his forehead, from which formed the Holy Grail. The ancients also believed that the Greek god Hermes recorded the laws of magic upon an emerald tablet. We have best quality Columbian emerald. To get it contact us.